Here are 8 New Features that we spotted during the Assassin's Creed Syndicate Reveal. A full seasonal system with Spring, Summer, Fall, and Winter will be included in AC Syndicate. Assassin's Creed 3 was the only other title in the series to have this feature. Syndicate will be set in the Victorion London period of 1868, during the "Golden Age of Piracy". This was the beginning of the industrial revoultion and the basis of the story. The developer also stated there will be 7 boroughs in total with London being one of them. During gameplay, Jacob was shown using a throwing knife to drop a suspened sack of barrels on top of an enemies head, killing him. The rope launcher is a new gadget that works similar to a grappling hook. In the reveal video, Jacob is shown escaping from a fight by shooting the rope towards the sky ala Batman. The developers also stated that you will be able to "climb the highest building in seconds or zip from rooftop to rooftop". Players will be able to not only drive vehicles, but jump on top of them and assassinate/kill from them. Trains and carriges are confirmed to be two of the options with gameplay the latter being shown during the reveal. Syndicate will be the first main-line Assassin's Creed game to feature a female protagonist. Aveline (Liberation) and Shao Jun (Chronicles China) were playable but were both featured in a smaller release. 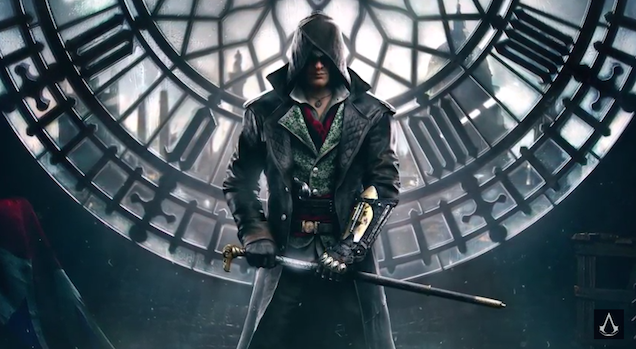 This year fans will be able to play as either twin, Jacob or Evie Frye in Syndicate. Syndicate aims to focus more on hand-to-hand combat rather than the usual sword based combat everyone has become used to. The setting dictate that people would not have been walking around with swords, but instead would have short blades, brass knuckles, and use their fists in close combat. The developers also stated that this would be the "fastest combat ever". "Street gangs will be our army. The slums our fortress." Gangs are one of the more prominent focuses in Syndicate. To take control over a borough, players must duke it out in a gang fight reminisent of "Gangs of New York" with both gangs facing off in the middle of the street.